Hex is one of the most immersive rides at Alton Towers, if not Europe, and is set within the ruins of the Towers themselves. 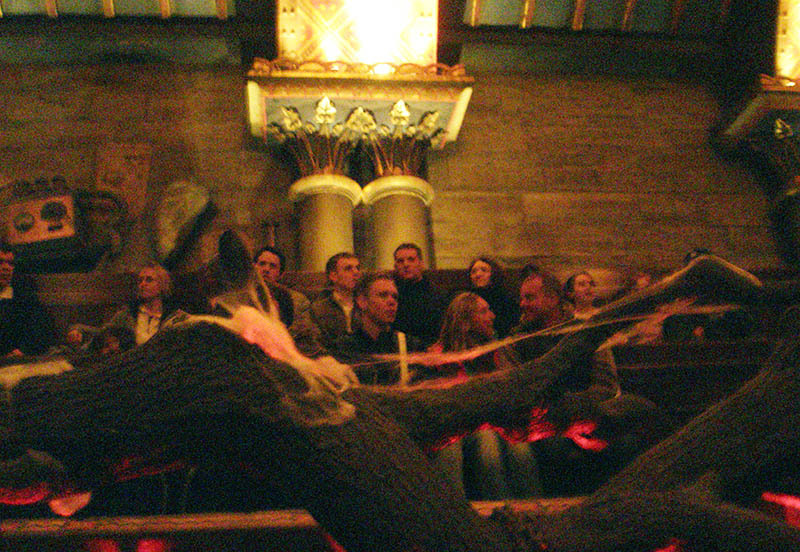 It takes its theme from a local Staffordshire legend, making it a thoroughly unique experience that could not be hosted at any other theme park in the world. The attraction makes great use of the real Towers building, which houses the majority of the queueline and preshows, with only the ride itself taking place inside a specially constructed warehouse. The transition is so cleverly done that most guests will not realise that they have ever been outside the authentic Towers ruins. The quality of theming and preshows is first class, and the local legend on which the ride's backstory is based is used to full advantage. The ride itself is wonderfully decorated, and arguably provides one of the best experiences of its type. For visitors wanting to find the real heart of Alton Towers, Hex is one of the theme park's must-do attractions. While the queue can at times appear intimidatingly long, thanks to the ride's large capacity it rarely takes too much time to get to the front. "For every branch of the old oak tree that falls, a member of your family will die." Later that night there was a huge storm and a bolt of lightning hit the oak tree in the woodland surrounding the Towers, severing one of its branches. As the story goes, that same night one of the Earl's family members suffered a sudden and mysterious death. Shocked, the Earl had the oak tree's branches chained up to prevent a similar tragedy happening again. Adventurous visitors can go exploring in the woods and still find what has become known as the Chained Oak today, complete with its rusting chains. 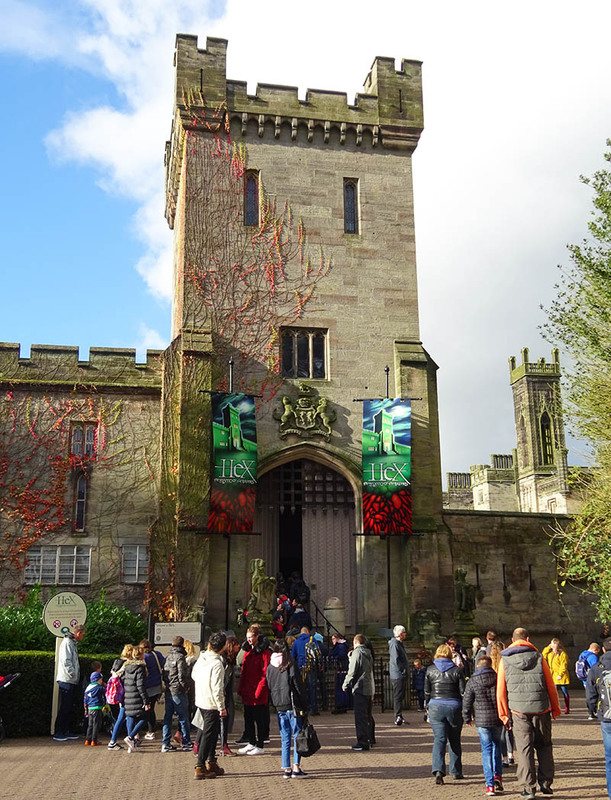 Alton Towers' version of the legend has been embellished somewhat, having the Earl dragging the fallen branch back to the Towers and hiding it inside a secret vault, from which he conducted crazed experiments in an attempt to banish the curse. Note: Hex is best experienced without knowing all the details of the attraction and its storyline, so readers who have yet to ride it may wish the skip this section. Theme park guests begin their Hex experience by entering through a giant door into the Towers' original Armoury, which now hosts the attraction's queueline. This is filled with scaffolding and building works, with TV screens beginning to tell some of the backstory: recent restoration works at Alton Towers have found a secret passageway concealed behind a bookcase, which leads to what appears to be a sealed vault. At the head of the queue, guests are batched into groups of 78, and hear a short audio recording giving some more information on the 15th Earl and his association with Alton Towers. The group then moves forward into another room where they are shown a film that fills in the details of the legend. Guests move on from the cinema room and into the Octagon, a high ceilinged room with eight walls covered in dust sheets and scaffolding, all dimly lit by electric lights powered by a whirring generator. Suddenly, sparks appear from the generator as it shorts out, and the room is plunged into darkness. There is a clap of thunder and the room is lit by lightning flashes for just long enough to see a strong wind blowing a curtain hanging over one of the windows, as a startled horse is heard in the distance. High up on the scaffold, a glimpse of the old woman can be seen as she starts repeating the incantation of her curse. The generator splutters back into life, providing just enough light for guests to find their way up a flight of steps and pass-by the bookcase and into the hidden passageway beyond. 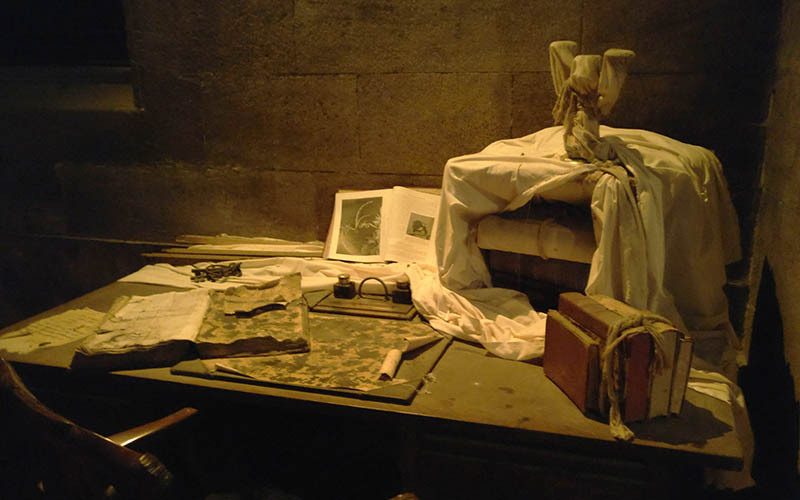 At the top of the passageway, guests enter the secret vault via two sets of doors, and are sat on two rows of benches running along either side of the walls. These face inwards towards the vault's centrepiece: the fallen branch itself. Once the safety bars have lowered, the lights dim and dramatic music begins to play. The branch, together with the benches on which the guests are seated, begin to swing - gently at first, and then higher and higher until guests find themselves hanging upside down staring at the floor of the vault below. Strange then how even gravity seems affected by the cursed branch, as neither guests nor their belongings fall to the ground. As the music reaches its climax, a face appears in the floor surrounded by wooded roots, and the branch begins to sparkle. The benches stop spinning, and riders are returned to the ground face up. As the safety bars raise, guests stand up and exit the ride, leaving with several questions: Did they really turn upside down? Was their mind deceiving them? Has the curse been banished, or have they themselves just become part of the Legend of the Towers? The photo below, taken from the roof of The Towers, gives an aerial overview and reveals the location of the ride building itself. The Armoury runs from the left of the picture, with the cinema room beyond. This leads to the Octagon in the right of centre. The green warehouse building further to the right is the show building that houses the ride itself.